During a slow week during the Democratic convention, there wasn't a whole lot of polling work being done out in the field. Rasmussen, which is the largest provider of polling data this cycle, took the week off, but CNN filled the void with four polls in swing states. Overall there were eight polls in eight states. And despite the relative lack of polls, there were some interesting shake ups in our various metrics. Perhaps they weren't as big as McCain tapping Sarah Palin as his running mate, but they were big nonetheless. There is a lot of blue in the polls on the surface, but there are some interesting quirks in there as well. The CNN poll in Colorado handed McCain a one point edge in the Centennial state, a state that has been favoring Obama throughout, but that was counteracted by a similar, yet opposite, result in Florida, where Obama is up a point. Both are tightening as we enter the traditional kick off to the general election campaign (post-Labor Day). Other than those, there aren't any real surprises. Idaho is a little more strongly McCain in the Greg Smith poll there than it had been in the only other two polls conducted. Both New Mexico and Pennsylvania have favored Obama since he wrapped up the nomination (and before that for that matter), but both had drawn closer in some recent polling. The CNN polls in each then, are running ahead of where we have both states in our weighted averages. Ohio is tied as is Nevada. Ohio had been drawing attention in these posts of late due to the relative volatility in the polls triggering a back and forth between the Buckeye state favoring Obama or McCain. It has settled into Obama territory, but the margin is still razor thin. The real news is that the tie in Nevada has brought the weight average to a tie in the Silver state. This happened with Ohio earlier in the summer, but that is the only incidence of that having occurred here. Nevada, too, is very close -- obviously -- but this shifts the partisan line in the Electoral College Spectrum below to Nevada instead of between Nevada and Virginia. But I'll get to that shortly. The map then has a change for the first time since the recent Ohio flip-flop. [Sorry Ohio, I've heard a bit too much John Kerry this week -- at the convention and this morning on This Week on ABC. Flip-flop is fresh in my mind.] The underlying dynamic remains the same though. Obama still has that cushion of strong states, but has lost five electoral votes due to Nevada shifting into the gray area it is currently occupying on the map. ***The line between Colorado and New Hampshire is the where Obama crosses (or McCain would cross) the 270 electoral vote threshold to win the presidential election. That line is referred to as the victory line. Nevada, Ohio and Virginia remain the states to keep an eye on. Each is tight now, yet together they don't provide McCain with enough electoral votes to surpass 270. Nevada didn't move, but several other states -- states which had polls this week -- did move on the Spectrum. Idaho became even more intensely red while Florida moved in the opposite direction, moving closer to the partisan line -- the point at which states begin favoring the other candidate. On the blue end, New Mexico became bluer, jumping Wisconsin on the weight of that CNN poll while the single digit PPIC California poll pushed the Golden state past New York and closer to the partisan line. California and Idaho aren't going anywhere, but the fact that Florida and New Mexico are moving in Obama's direction is worth noting. Both move off the Watch List to end August, which brings the list under ten states for the first time since we added it. While this isn't definitive, it is on some level more evidence that the race is settling down and that the true battlegrounds are shaping up. Convention season may do something to shake that up, but we'll settle in again after that as we move further into September and closer to that first debate at the end of the month. This week, as convention season has kicked off, we've cast an eye on the various sanction regimes that could be employed to deal with the frontloading of presidential primaries and caucuses in the future. Along the way I've done my fair share of mocking the current hollow sanctions. One question about 2008 remained though: Would the McCain campaign and the RNC let the sanctions slide for Wyoming, New Hampshire, Michigan, South Carolina and Florida? All five had their delegations cut by half for holding nominating contests prior to February 5. Well, the word out of Wyoming is that those sanctions are alive and well. Furthermore, those from the Cowboy state will be sitting in the back of the hall in St. Paul (That rhymes a bit too much. I feel like Jesse Jackson describing what he felt was the "inclusion illusion" at the 2000 GOP convention now.) with the other states in violation. The obvious question now is, does it really matter? Would any of these five states have changed what they did? I doubt it. But sticking to their guns isn't something the GOP will be able to highlight with any great effectiveness this week. They can't come out and say, for example, "The Democrats flip-flopped on this, but we didn't. We're the party of reform." Well, I suppose they could, but they'd risk turning off some people in hotly contested states like Florida, Michigan and New Hampshire. They would not be able to fall back on the excuse Florida Democrats used in defense of their position to remove the stripping of all of Florida's delegates by the DNC. In other words, they wouldn't be able to blame it on the actions of the other party. Florida's state government (legislature and governor) is controlled by the Republicans. In Michigan, Republicans also had their hand in the state's move, though not to the extent that Florida Republicans did. Only New Hampshire's move was solely due to the decisions of Democrats. But that's due to the quirk of New Hampshire election law that leaves the decision up to the secretary of state, Bill Gardner -- a Democrat. He was given the ability by the Granite state legislature in the 1970s -- Yes, he's been the secretary of state there the whole time -- so that the state could quickly and efficiently to deal with challenges to their first in the nation status. This want see the light of day this coming week in the press, but given our discussions here this week, it is certainly worth noting. NOTE: I'll be back later in the day with a later-than-usual Sunday update of the electoral college projections. Earlier this week, we looked at a prediction of how well both Bob Barr and Ralph Nader would do in November based on the Libertarian/Nader vote in 2004 and the state of polling on them both on the state and national levels thus far in 2008. A simple model, but one we can enhance. FHQ commenter and Election-Projection proprietor, Allen, spoke about the 2000 election in response to that post (...posing an altogether different question, but certainly one to look at.). And that got me thinking: What would adding in the data from 2000 do to the regression? It would do a couple of things. 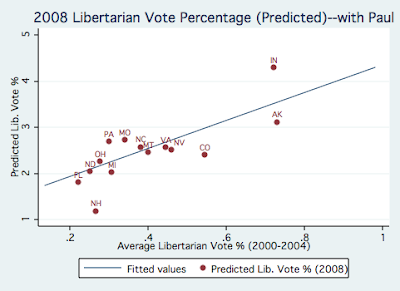 First, it provides a more consistent measure -- across two elections -- of the libertarian vote. This is advantageous because it eliminates the possibility that the events unique to 2004 are driving the changes we see. However, the drawback to adding in that data in is that it likely inflates to some extent the vote share Nader would be predicted to receive in November. 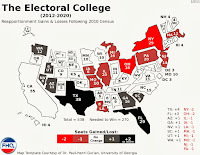 As I said earlier in the week, though, the goal right now -- especially with the limited amount of polling we have for both third party candidates during this cycle -- is to get an idea about the relative effect each will have across the 14 states that FHQ has as toss ups at the moment in our electoral college projections. What happens is that we don't see any monumental shake up, but there are some subtle shifts. In looking back at the Libertarian scatterplot from the previous post, there's not much difference in the predicted vote share that Bob Barr would get in November here. [Though there is a bit more dispersion here the focus should be on how high or low the point is.] There are three main groupings of states: Alaska and Indiana in the upper right, a group nine states in the middle, and Florida, Michigan and New Hampshire at the bottom left. To reiterate a point from earlier, the three closest states on the most recent Electoral College Spectrum -- Nevada, Ohio and Virginia -- are close enough that two to three points won by Barr could make a difference. However, if those states are that close, what we see here is likely to have been an exaggeration come November. Swing states across the 2000 and 2004 data typically yielded smaller vote shares to third parties than the less competitive states. Voters are willing to vote in protest if the candidate from their party has already seemingly won or lost the state. One more thing we can add to this is how Ron Paul did this year in the Republican primaries. These are voters -- his supporters -- who are organized and perhaps inclined to vote for the Libertarian candidate. Ultimately, what this is measuring is the intensity of Paul support across states. A variable controlling for caucus states has been included to deal with contests where Paul did better on the whole than in primary states. Montana, Nevada, North Dakota and Pennsylvania all see modest jumps while the remaining states hold relatively steady when compared with the plot above. That's three caucus states (Montana held a caucus on the Republican side) and one primary state; two McCain toss ups and two Obama toss ups. Again, the same caveats as above apply in the case of a competitive state -- which all of these are. However, Nevada is in a bit of a gray area here. Yes, it did have a caucus, but Nevada was a state where the Paul forces were very well organized. They completely disrupted the state convention in the Silver state and left Nevada without a delegation to next week's convention until just hours ago -- when the state Republican Party named the delegation. In a state that is as close as Nevada, this matters. Whether Barr's numbers are inflated in the state is beside the point. If those Paul supporters turn out and if -- this is a big if -- the opt for Barr, then McCain may have issues turning the tide there. That's the story on the Libertarian front, but what about the impact Nader is predicted to have later in the fall? 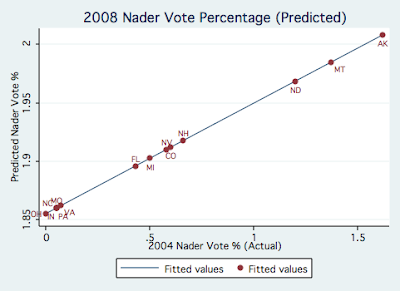 As I said at the outset in explaining the inclusion of the 2000 data, Nader would be expected to gain as a result of the inclusion of an election where he outperformed the 2004 numbers we used before. This distribution is also largely similar to the original plot with just the 2004 vote data. Ohio is the only state that really makes a move. Even with that 2000 data, Nader's predicted vote share for the upcoming election is still modest, only just more than 2 points at the most. In the end though, the message is largely the same as what we saw earlier in the week among these toss up states with regard to the Barr/Nader effect. There is the potential for influence, but the main question is whether close states follow form, not giving third party candidates as large a share of the vote as in other states. Somewhat tangentially, there's another issue I'd like to raise in this context. Earlier this week when FiveThirtyEight ran the latest CNN state polls, they used the version with the two party vote question as opposed to the four way race data. That has since been changed, but it started something of a discussion over there, and that is a discussion that is relevant here as well. It has implications for our electoral college projections. As I've discussed in this post and in others on the subject, it is likely that the third party percentages in polls are inflated in relation to where vote choices will ultimately be. That being said, is it beneficial to proceed with the four way polls or to go for the two way race version? In one version the third party aspect is supressed and that has an impact on the accuracy of that poll. But the accuracy of the four way polls are questionable as well since those numbers may be skewed here during the late summer weeks. What are people's thoughts on this? I have, to this point, included that four way race data when available. If Taking Away Delegates Won't Stop Frontloading, What Will? Who is Sarah Palin? The race is on to find out. Chris Cillizza at The Fix weighs in as do the folks over at The Caucus. The Caucus also describes the battle to define the Alaska governor...by both parties. Nate Silver at FiveThirtyEight provides a glimpse into the early polling being done on McCain's VP selection and the breakdown among men and women is surprising. Here's the speech from her first appearance with McCain following the announcement. With the Republican convention set to kick off on Monday -- weather permitting -- the talk has shifted from the bounce the Democrats got or may have gotten to projections of how well the GOP will do in the polls after their own gathering. Who's McCain Going to Pick? Why, Sarah Palin, of course. **Note: This continues a discussion begun yesterday and continued in the comments section today. For a refresher or for the starting point follow this link. I think discussions like the one here and the ones we've had in this space over the last weeks and months are constructive. For better or worse though, I'm one of those devil's advocate types. So I'm not trying to tear down any reform ideas so much as point out the obstacles those reforms may face. Having said that, let's look at what everyone has brought to the fore this morning -- some interesting concepts, by the way. Let's look first at the financial situation. The national party funding regimes that both Allen and Russ describe have one drawback that I can see: the discrepancy between the money either parties have on hand at any given moment. The DNC during this cycle -- and typically during most cycles -- has far less cash on hand than the RNC. That has implications for the effectiveness with which each party is able to implement a similar system. This check-off system that Scott envisions is one way to get around that issue though. But again, we're talking about the difference between the national government and the national parties dealing with this. Rob mentions the candidates "caving" and seating delegates anyway. I don't know that caving is the appropriate word to describe what is happening there. But it isn't any less of a problem. The act of (re)seating those delegates is a nod to the idea that unnecessarily preventing those delegates from participating -- especially when they are not consequential to the outcome of the nomination -- is just manufacturing divisiveness in the party. No one seeking the highest office in the land wants any divisiveness during the unfiltered PR blitz that is a convention. But this gets at the dual nature of the delegate system. Delegates offer diminishing returns over the course of an election year. They are consequential to the point that the nomination is decided, but after that point, they really aren't of any consequence. Then penalty, then, if it is to include delegates, has to in some way wedge itself into that early period. But the penalties in 2008 (and 2012, it looks like) did that, but the penalty loses its bite if the nominee decides to seat those delegates. Yeah, back to that vicious cycle. We really need to check into whether Florida, Michigan, New Hampshire, South Carolina and Wyoming will have half delegations in St. Paul this week, or whether McCain has opted to waive that penalty. Let me raise one more issue that has yet to be brought up in any of our discussions. This was a factor that I found in my masters thesis and subsequent conference paper really affected a state's ability to frontload its primary. It has implications in our discussion here as well. Some states, California, Texas and Maryland, to name a few, have laws on the books that require primaries for president and primaries for state and local offices to be held simultaneously. Changing those laws and splitting those contests up cost money. Yes, that's not that big a deal if the national party or the federal government is picking up the tab, but it does raise another potential complication. What id the GOP wants the Maryland primary to go in May while the Democrats would rather hold the Maryland primary in March. First, that would deprive Maryland of the option of holding its state and local primaries at the same time as the presidential primary. Secondly, this is creating another election that Maryland wouldn't have to pay for but would have to administer. That puts a strain on state and local boards of elections to deal with that, adding some potential messiness to the process. Now, I'll concede that Maryland could opt to hold the Republican primaries with the Republican presidential primary and likewise with the Democrats. That gives a jump start to one party's congressional candidate, for example, at the expense of the other party's. And if the advantaged candidate is an incumbent, that increases an already significant advantage they hold. Well, just hold the state and local primaries together at a time different from the presidential primaries; it won't cost any extra if the national party or national government is paying for the presidential election. This looks like a minor problem from the national perspective, but at the state level could serve as a point of contention. The people making the decisions on this are the members of the state legislature, and their electoral fortunes are tied to the decision to some degree. Holding the contests -- presidential primaries and state and local primaries -- simultaneously increases turnout. Now, it is certainly debatable whether these guys want high turnout or not, but debated it would be. Note: I'm going to try and get this revised Barr/Nader post up later today. Also, I've added a question to that, that I'd like some feedback on. If you have a chance, check in later and weigh in. Tangentially, it will have implications for the electoral college projections. Obama is the J.K. Rowling of Politics? Well, this is a bit of an emperor's new clothing moment. Alright FHQ, you complain about the lack of sanctions in dealing with the frontloading problem, but what would you do? A fair question. I could go all political sciencey on you and claim that it is my job to explain what we see and to steer clear of the normative end of things. [It isn't my job to say what should be. That's up to the practitioners.] However, I'll at least attempt to explain why I think sanctions from the parties just won't work. There likely isn't a good sanction for this just because of the cyclical nature of the problem. In the post-reform era, delegates have become largely meaningless...except when it is close. And that doesn't happen often (There are exceptions, don't get me wrong, but we won't see another 2008 for a while.). Delegates do decide the nominations, but that is after a party has quickly coalesced around one candidate -- usually the front-runners. So the delegates don't matter because the compressed contests advantage one candidate over the others. But you can't take away meaningless delegates to get states to move in line with a more evenly dispersed calendar of contests. What's the alternative? Revoking the primary? I don't think that will fly with the fairness crowd. During a brainstorm in 2007 when Ohio was considering a primary move (to the same January 29 date Florida had moved to), I thought about close margins in the previous presidential election being a possible determinant of which states could go first. I don't think that passes muster either. Though, one interesting caveat is that both Iowa and New Hampshire were among the closest states in 2000 and 2004; among the few states that actually shifted parties in that time. That indicates that both have a partisan breakdown similar to the ultimate outcome of the election, but that doesn't lend itself to a partisan primary. Though the ideological spectrum in the state is like the nation's to some degree, the spectrum within each party may not be very well represented by anyone state's partisans. Such a plan would potentially work in a Louisiana-style, open primary. But I don't see that happening. Another possibility is that turnout in the previous presidential election could set the calendar for the next cycle. And even if that didn't advantage the toss up states where competition drives increased turnout, there are still questions over whether that is a good thing or not. Turnout may increase, but is that a good thing? Are the decisions "better" as a result? Neither of those plans would work, but both would require some intervention by the federal government. And that's something to take away from this. The GOP may be going through the motions in the hopes that Congress steps in in some way to solve this problem for them (...and the state parties and state governments). Yes, that is an odd statement to make about a party that would rather see less government intervention on the whole. Along those same lines, part of what one commenter recently proposed made some sense. If the federal government got involved, it could technically withhold funding in the way it does highway funds for states that don't have the drinking age set at 21. Now a financial penalty would be effective, but that implies the federal government is in some way funding elections. And withholding funding for elections is a potentially dangerous business. It doesn't and wouldn't look good. But the burden would be on the states in that case. They would have to cover the expenses in that case or take it to court. My guess is a state would lose that PR battle, not to mention the court case. Is Congress too partisan to do anything about in the same way that the national parties are? Is Congress willing to step in and actually do something that, as Dan Lowenstein has argued, would be challenged but likely would be affirmed in the courts? Of course Lowenstein concludes with what is essentially the same thing that the GOP seems to have settled on: a cap on further frontloading. So what are the penalties that would work? That isn't clear to me (or many of the others dealing with this issue for that matter). But it will likely require some action from Congress. As a footnote, I'll pose just one more question. Does the fact that the Democrats won't deal with the issue for another two years hurt the chances of something being done on frontloading prior to 2012? We know that the GOP has rejected an overhaul of the primary system. But we won't know the direction the Democrats are leaning until that report comes out down the road. This topic is hot now. It is on people's minds to some extent. However, does that heat fade; does that attention wane over the next two years. And will that affect Congress's willingness to weigh in then. Some of that, I suppose, depends on whether any states begin the frontloading process and antagonize the system. States then may be hesitant to do anything. If Obama wins, though, we may see some Republican-controlled legislatures make movements in that direction. If Michigan, for example, wants its lot improved, Democrats there may want to go along with any Republican initiative to move the state's primary ahead of March 6, 2012. That may be enough to start the ball rolling on the federal level, if such a move incites any backlash and the issue is raised again. A tip of the cap to Scott for taking the bait that I hadn't really intended as bait. Update: Apparently, it is Palin. She and Pawlenty apparently switched positions on InTrade overnight and she's approaching 100% now. Thoughts? Does this pull in those Hillary voters? It certainly shakes things up, though perhaps not in the way that David Brooks alluded to on PBS the other night. Does her age take Obama's age/experience off the table to some extent? You have to love the call-in portion after C-SPAN's coverage. A caller just linked Obama's brand of politics to the "in one ear and out the other" -- the caller's words, not mine, Rowling fans -- literature from the author of the Harry Potter series. Seriously, though, thoughts on the speech? Assertive and directed right at McCain and the Republicans. The GOP will certainly have an answer next week, but Obama made it more difficult for them to some extent. But there were some openings for them as well. In the same way that the Democrats made the "McSame" argument all week, the convention in St. Paul next week will most likely attempt to paint Obama as the typical big government, tax-and-spend Democrat. What is the price tag on the hope Obama is selling? ...but given the way Ohio Republican Party Chair is lashing out at McCain over the plan's rejection in the rules committee, that doesn't seem like a much of a chance. Nevertheless, the plan will have a final vote tomorrow as the rules committee will vote to approve the rules governing primaries and caucuses for 2012; rules which will be ratified at next week's convention. CQ added one more piece to the puzzle today, though. States violating the "no one goes before the first Tuesday in March but Iowa, New Hampshire, Nevada and South Carolina" rule will be penalized half their delegates in 2012. Yes, the same penalty that kept Wyoming, Florida, Michigan, South Carolina and even New Hampshire from moving ahead of February 5, 2008. No, not even the Granite state had an exemption in 2008, but all of the above will likely have all their delegations seated next week, and much more quietly than Florida and Michigan this week at the Democratic convention. It is likely then that we will see a few more renegade states in 2012, though as I explained last night, the identity of those states will have much to do with which party actually wins the 2008 election. States with legislatures controlled by the party out of the White House are the ones more likely to move; more likely to be renegades. That, in itself, will constrain movement of the sort we saw in the lead up to 2008. But it won't completely stop it. And from the looks of, the status quo sanctions the GOP is putting forth won't either. States will forego those delegates in exchange for some level of influence over who the next presidential nominees will be. What, during the Democratic Convention? Yeah, let's look at what's ahead for and what's in store from the Republicans. First let's look at the St. Paul convention next week. The GOP convention is already under attack, and not just from Democrats. Tropical Storm/Hurricane Gustav is heading into the Gulf of Mexico and forecasts have it making landfall sometime early next week -- during the Republican's convention -- in the New Orleans area. Now, I'm not positive, but I'm pretty sure remembering Hurricane Katrina was not at the top of the list of things to be highlighted by the Republicans next week. So already, even before the convention kicks off, there have been, now, two things that have "gone wrong" for the Republican Party. First, this developing story in the Gulf isn't helping the party of Lincoln stay on message, and second was the news that the GOP is basically doing nothing to combat frontloading ahead of the 2012 election. Now, one of those is obviously a bit higher up on the priority list at the moment. People won't truly be paying attention to the frontloading thing for another three and a half years, but given the mission of this site, FHQ finds it necessary to include it here. Already the weather has claimed the speaking spot allotted to Louisiana governor, Bobby Jindal, who has pre-emptively declared a state of emergency in his state. That's a blow to the party because the Republicans now miss out on an opportunity to show off an up-and-coming presence within their party, someone who was mentioned as a possible running mate for McCain. Obviously, this is an unpredictable situation, but it is worth tracking as we approach the Republicans' turn in the spotlight. 1) When will the decision be announced? Today? Tomorrow? Some other time? 2) Who will it be? 3) Have the Biden selection and the Democratic convention given McCain reason to reconsider an already made choice or to alter the thought process on the matter altogether? The comments section awaits for not only answers to those questions, but your thoughts on last night's proceedings in Denver. H/t to Daniel for alerting me to the weather implications for the Republican convention yesterday. NOTE: Also, I'm going to try and add in the 2000 data on the third party post from the other day. If I get to that, I'll have something up later in the day. Though tempers flared, the GOP rules committee rejected the Ohio Plan which would have completely reworked the timing of presidential primaries and caucuses for the 2012 cycle and beyond. What was left in the wake was anger, finger-pointing at the McCain campaign and accusations of behind-the-scenes meddling. I was always skeptical that the GOP would do anything on this front, but I didn't expect that news to come out in this way. It isn't that I thought the GOP would drag its feet on curbing frontloading, but there was dissension within the party from the point at which the committee passed the plan for a hearing at the upcoming convention back in the spring. And as I said, back when I speculated on how McCain would have fared in this year's contests under the Ohio Plan, successful nominees just don't tinker with a system in which they were successful. What does this decision mean? It means that if the Democrats win this election, there will be no difference between the 2008 cycle and 2012. Correction: There will probably be even more frontloading as the progression toward a national primary continues. If the Democrats are successful in November, they will not be seriously interested in changing things for 2012. 2016 maybe, but not 2012. Even if McCain wins in November, I suspect the Democrats won't do too much on their part simply because they won't have the cooperation of the GOP. To completely change things will require an effort on the part of both parties to rein in the partisanship that stems from state legislatures and state parties. What the GOP did do in Minneapolis was to close the window on frontloading a bit. Like the Democrats, they too have stressed the importance of shifting the earliest possible date on which contests could be held to the first Tuesday in March. So let's go ahead and mark Tuesday March 6, 2012 on our calendars. There will be a lot of contests that day. It won't be just Ohio, Texas, Vermont and Rhode Island in the spotlight that day like in 2008. But one question remains: What are the sanctions for violation of the potential new timing rules? There are over a dozen states that permanently moved their primary elections through action in their state legislatures. That work will have to be redone. But what is motivating states to do that work? What will they gain by moving back and what will they lose if they don't? The answers to those questions will tell us in quick order whether the calendar of contests is going to be any different in 2012 than it was this past winter and spring. And there still isn't a good answer. UPDATE: Here are the reactions on the move from New Hampshire and from Ohio. Rob brought this issue up in the comments to last night's convention post, but the traffic has likely shifted from there and the roll call is certainly worth its own place. Here are a few things I've been able to dig up regarding the process. 1) DemConWatch has it that the floor vote will be a truncated affair. The voting will take place beforehand. 2) In fact, jack-of-all-trades, Seth Masket, who is a delegate, a blogger and a political scientist confirms that the Colorado delegation voted this morning at the delegation breakfast. What we'll see tonight is a part of the deal hammered out between the Clinton and Obama teams. We'll get a limited number of states announcing their results and then they'll move on. I'd guess the New York delegation plays a prominent role. Regardless, the roll call will take place between 5 and 7pm ET, so C-SPAN will be where I'll be able to catch it. I don't know what the cable news outlets have been doing (gavel-to-gavel coverage?). Bill Clinton is on at 9pm and Biden follows during the latter half of the 10pm hour. This is certainly a step back from the multitude of polls that were released during the latter half of last week, but 11 polls from 8 states isn't too shabby. And six of those eight states are toss ups here at FHQ. There is the potential, then, for some movement on both our electoral college projection map and on the Electoral College Spectrum. In most cases, these polls confirm what we already know about the state of the races in each. Texas remains comfortably in McCain's column, though perhaps not as comfortably as recent electoral history would lead us to believe. In Rhode Island the story is similar. This is just the fifth poll in the state and the only one since the end of June, It, nonetheless, is in line with where FHQ's weighted average was with the 21 point margin in Brown University's poll. The real action is in the toss up states, though. Even though there were no shifts -- between candidates or categories -- there was some some rearranging as far as how states were positioned relative to each other. None of these toss up states through these polls really performed outside of what our expectations would be at this point. The possible exceptions are Colorado, Florida and Pennsylvania. The five point margin in the Suffolk poll of Colorado is about twice what we have it in our average. And that margin certainly differs from the tightening in the Centennial state that we have seen in recent polling. In Florida and Pennsylvania the story is slightly different. While the 7 point margins in the Strategic Vision and Quinnipiac polls, respectively, show wider margins than our average would otherwise indicate, they are not out of line with other polls in either state. Pennsylvania has been consistently within the mid-single digit range in Obama's favor since he claimed the Democratic nomination. And Florida had shown a similar margin in McCain's favor as recently as the end of June. The Sunshine state has since seemed more competitive, but this result is not as out of whack as the Suffolk poll in Colorado. 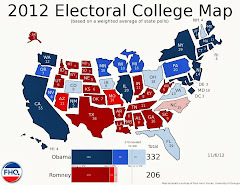 The result is that the map retains its 298-240 electoral vote margin, giving Obama a slight lead overall. Most of that margin can be accounted for by the difference in the Strong and Lean tallies on each side. In Democratic strong and lean states, Obama has 222 electoral votes, while McCain, in his strong and lean states has 154 electoral votes. That 68 electoral vote deficit mirrors pretty closely, though not exactly, the 58 electoral vote margin that the map shows today. But that's 222 electoral votes and not 272 for Barack Obama in those strong and lean states. In other words, the toss up states still matter. If any one candidate claims the momentum down the stretch, those 14 states, in whole or in part, could move in the direction of the candidate with the momentum. 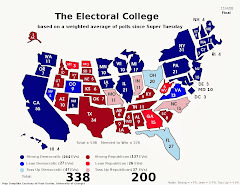 And as the Electoral College Spectrum below shows, Obama still needs to maintain a lead in three or four of those Obama toss ups to clear the 270 electoral vote barrier. Due to that lead in strong and lean states, though, the Illinois senator still has more paths to victory than does his Republican counterpart from Arizona. Obama maintains the ability to cede some of those toss up state and still win the election. McCain, at this point, does not have that luxury. Even if McCain is able to keep or sway the three most competitive states -- Nevada, Ohio and Virginia -- in his direction, he still falls short of 270 electoral votes. The spectrum does look largely similar to the rankings on Sunday. Florida and Alaska flip-flopped -- Yeah, that means something different in this context, doesn't it? -- positions, but that is the only shift. I will note that Pennsylvania is continuing to move further into the blue. As of now, the Keystone state is close to surpassing Michigan as the final toss up state on Obama's side. Biden effect? Eh, I'll hold off on making that claim for the moment. On the Watch List, there isn't much to talk about. Florida's trip off the list was short-lived as it has returned to a position closer to switching to a McCain lean state. But the Sunshine state is still within Obama's reach. Not as close as a state like Virginia though. I suspect Obama will continue to spend in Florida, but some of those resources may be shifted in Virginia's direction at some point. Let's recall that McCain has yet to do any spending in Florida. Obama, then, has made up some ground, but has yet to bring the Sunshine state into his column. The flip side of this is that there is likely a pretty large contingent of Clinton voters in the state that, if won over during this week's convention, could make a difference. Only one act of the unity effort is complete, though. Act two is tonight and act three follows tomorrow night from Invesco Field. Both may tell us something about how successful Obama is at pulling those Clinton folks into the Democratic fold. Hey, political scientists like to have their egos stroked too. Below, Karl Rove weighs in on Hillary Clinton's convention speech and discusses convention bounces, citing Tom Holbrook along the way. Hat tip to Melissa for the heads up. UPDATE: And Kayla sends us a video from ABC showing some anecdotal evidence of speech effects from Clinton's address last night. Now a question: Were the delegates more easily swayed than swing voters/Hillary supporters not in the hall last night? On the one hand, they are loyal to Clinton, but as a result are they more likely to follow the New York senator's wishes than folks who, while they supported her, may not be as likely to go along with her on this one? You have to do something to break up this "tension," right? "That's not a maverick; that's a sidekick." "George Bush took office on third base and stole second." This is the type of stuff that I recall from four years ago...at the GOP convention. One cut at Kerry and the Democrats after another. It is the type of playful mocking the Democrats were hesitant to use in the post-9-11 environment. Having said that, mocking is an equal opportunity employer; the Republicans will have their fair share next week. 2008 isn't 2004 and it is more fun that way. I've been sidetracked all day, so I've missed the opportunity to ask, but what are everyone's thoughts thus far (pre-Clinton address). When Zogby released their interactive poll results for the ten states they label battlegrounds over the weekend I considered once again looking at where Bob Barr was doing well. After the 34 state polling release in early July, we saw that Barr was faring quite well -- perhaps too well -- in some states that would make John McCain's job that much more difficult. Instead of doing that again, though, I thought I'd see what kind of data I could gather that would help us gain a better idea of how both Barr and Nader would potentially affect the upcoming general election. 1) State polls charting a three or four way race. 2) National polls with either a three or four candidates included. 3) The share of the 2004 general election vote that both Nader and the Libertarian Party nominee, Michael Badnarik, received. While there is a limited amount of data for the current cycle at both the national and state levels, the picture of a multiple candidate race can be augmented by the 2004 data. That provides a better sense of who does well and where. Since late May when Barr was nominated to represent the Libertarian Party, there have been 30 polls in 15 different states that include Barr and/or Nader in them. And during that same period there have been 18 national polls with either three or four candidates included. 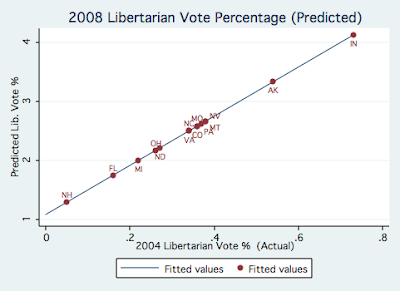 Again, this is a limited amount of information, but if we combine that data in a regression with the 2004 election results for Nader and the Libertarian Party, we get much closer to being able to predict if not how well both will do in November, then at least an idea of which states fall where in the pecking order. Let's look at each separately. 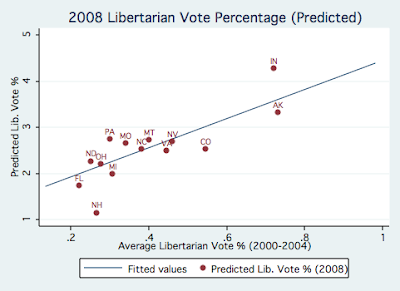 After the regression, we can plot the predicted vote share for, in this instance, Bob Barr against the vote share the Libertarian Party received in the 2004 presidential election. For the sake of clarity, I've only included the points for the 14 toss up states in our most recent electoral college projection, but rest assured the model includes all fifty states. On the lower left are toss up states where Barr does not take up too much of the the vote share on the right side of the ideological spectrum. That's good news for McCain in states like New Hampshire and Florida because the conventional wisdom holds that a Libertarian nominee would pull more from the Republican than Democratic nominee. On the other side of the graphic, though, there are a couple of states where there may be cause for concern for the McCain camp. Both Alaska and Indiana give over three and a quarter points to Barr. That may not sound like much, but when two regularly solid Republican states require some amount of defense, the Republican nominee would be better served if he didn't have to fend off attacks on two fronts. And tucked away there in the middle of the pack are our three closest states, Nevada, Ohio and Virginia. As tight as each of these are no amount of support for Barr would be welcomed by the Arizona senator, and two or more points may be enough to swing any of the three toward Obama and the Democrats. The situation is a bit different in the Nader context. 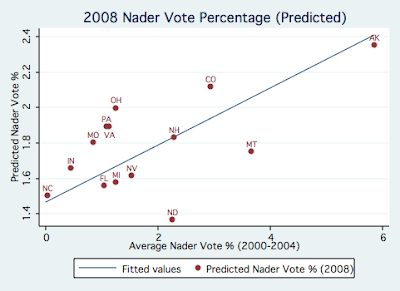 For starters, the same group who supported Nader in 2004 seem to be behind him again in 2008. Not the same exact people, but at least at this state a similar number of people. That can be contrasted with the Libertarian example above. The party of smaller and less interventionist government appears to have a much firmer footing in 2008 than it did just four years ago. Some or all of that may have to do with disaffected Ron Paul supporters who will hold their own gathering simultaneous to the GOP convention next week. It is a group that is certainly more energized during this cycle. But back to Nader. There is such a small range of vote share values across these toss up states. Nader is close to getting nearly two percent from each of these fourteen states (and for that matter all states since this is the same range in which the lean and strong states would fall as well.). And then there is the question that has been asked since 2000: Who are these Nader voters? Are they people who are only voting for Nader and thus not taking votes away from Barack Obama? Or does Nader represent a refuge for Democrats who won't pull the lever for the Illinois senator anyway? The former seems more plausible than the latter. Nader's share of the vote shrunk from 2000 to 2004 as Democrats, burned by the 2000 experience took a more pragmatic approach into the voting booth with them in 2004. Nader didn't really hurt Kerry; he wasn't even on the ballot in Ohio. And 2008, at least at this early juncture appears to be shaping up similarly to 4 years ago rather than 8 years ago. I shouldn't short the Nader graphic, though. It is interesting that Indiana is among the strongest states predicted for Barr and is on the opposite end in the Nader example. If Nader were to pull votes away from Obama, the Hoosier state is a place where the Illinois senator would get the best of both worlds: a minimal Nader effect, but a comparatively large Barr effect. Now, both accounts above come with some caveats. First, polls this time of year, both national and state, tend to overstate the position of third party candidates in the race. As we get closer to November, we'll start to see some movement toward one or the other of the two major party candidates. Diminished or not though, we do get from this a sense of which states are most likely to be affected by these third party candidacies. We can begin, for example, to look on this as a companion to the electoral college spectrum. Another issue is that this model is far from inclusive. We are dealing with a limited number of variables here, so we aren't dealing with the full world of factors. [Misspecification alert!] However, this does get us moving in the proper direction at least; especially in that it bring more information to the table than simply the minimal amount of three and four way polling that is available. I don't necessarily want to reprise the post and the resulting discussion here, but I thought it was important to update Saturday's examination of the August poll movement to reflect all the data we have through August. I'm treating the Biden announcement as part of the convention. Therefore, any polls conducted prior to August 23 are included in the analysis below. In other words, all the polls covered in yesterday's electoral college projection post plus the Epic/MRA Michigan and Columbus Dispatch Ohio polls are rolled into this update. The Suffolk poll from Colorado is omitted because the survey period extended through yesterday. No, the Biden announcement was not part of the convention, but with its proximity to the Democractic convention, it will be difficult to parse out those differences in the polls, ex post facto. As such, we will treat the two -- in relation to state level polling -- as one in the same. The map above provides a much the same picture we saw just two days ago. In fact, none of the states where polling had been conducted prior to Saturday, saw any change to the intensity of their shifts thus far during August. However, both Utah and Wyoming were shaded in based on the large margins the Mason-Dixon polls in each gave John McCain. Neither really provides any substantial break from the conventional wisdom though. If anything the relative "tightness" of both to this point in the race was notable. There are three other states that I kind of gave short shrift to the other day that I'd like to take the opportunity to address here in the absence of an in-depth analysis of the toss up states. Iowa, Minnesota and New Mexico are trending toward Johm McCain since the beginning of August. We've mentioned Minnesota's recent trends before, but they're worth noting again. The Land of 10,000 Lakes has seen a decided tightening in two of the three August polls. Both stand out as anomalous in the overall progression of polling in Minnesota. The slim two point lead in the Survey USA poll, as Scott mentioned, may have something to do with the way the firm is screening its sample. Indeed, the most recent Survey USA poll of Minnesota was in June during Obama's jump in the the polls in most states. While most polling firms showed an Obama lead in the mid- to upper teens, Survey USA had the race in a dead heat with Obama up by a scant one point margin. Minnesota and Survey USA may be like oil and water then. Still that only "explains away" one of those recent narrow leads for Obama in Minnesota. The other was the four point margin Rasmussen found in their latest sample of the North Star state. That one I won't dwell on, but I will say that when you take into account the high numbers of the "bounce" period -- and then peppered throughout the summer -- with the uncharacteristically low numbers we've seen recently, you get an average very similar to the one FHQ has overall now; one in the upper single digits. In Iowa the story is a bit different. Other than a 17 point margin in a February Selzer poll, the range of polling has been between 2 and 10 points within no discernible pattern emerging. This one has settled in and remains fairly static within the area of a 6 to 7 point edge for Obama. New Mexico is essentially a fringe toss up state, propped up by two favorable Zogby Interactive polls. When those are removed New Mexico does move into the toss up region but it is on par with a state like Missouri on the flip side of the Electoral College Spectrum. It is possible that McCain moves in and picks off New Mexico, but at this point that is the equivalent to Obama pulling Missouri into his column. The probability of those two things happening simultaneously in November is quite small, but one candidate winning both would be a clear signal that the momentum down the stretch has swung decidedly in that candidate's direction. Wow! Thirty-five polls in 21 states certainly augmented our database of existing polling between Wednesday and Sunday. And what's more is that we have a good idea about what the race looks like in several swing states that received a handful of polls each. Colorado, Florida, Michigan, Nevada, New Hampshire, North Carolina, Pennsylvania and Virginia all had multiple polls surface over the latter half of the week. Of those, Florida, Nevada, North Carolina and Virginia were all on the Watch as of last Wednesday. However, despite being inundated with new data, little changed. Surprisingly, Nevada, which has been so close to a tie lately, did not shift into McCain territory even with that 6 point Mason-Dixon margin included. For every 6 point margin there, -- in either direction -- there are three polls that show it as a race that is within 3 or fewer points. In other words, the underlying message on Nevada is that the Silver state is a statistical dead heat, given the margin of error in these polls. Since May there have been eight polls conducted in the state and two have shown six point McCain leads -- the most recent one and the oldest one in that group -- but the other six have resulted in smaller gaps in the results within the margin of error. Nevada, then, is the most closely contested race according to FHQ's metric. But Ohio is not far behind (Neither, for that matter, is Virginia, but I'll hold of on the Old Dominion for the time being.). In fact, as I alluded to in my look at the August polling trends, Ohio shifted back in the direction of the Illinois senator based on the inclusion of the 5 point advantage last weekend's Zogby Interactive poll showed in the Buckeye state. Some have issues with the methodolgy behind Zogby's online polls, but even if those two results -- the one in June and current one -- were changed to exact ties, McCain would only barely take the lead by just under a quarter of a point. The positive is that the poll is not the most recent -- Rasmussen's poll of the Buckeye state is -- so it isn't being given that extra amount of weight that the most recent poll is. And the back and forth in Ohio only further cements it as one of the closest races. But that isn't terribly groundbreaking news. Nevada and Ohio, then, along with Virginia represent a trio of states which are all within a quarter of a point of being a tie/switching sides and all three will factor heavily into the electoral math of each candidate. And though Obama has a nice cushion "strong" state electoral votes (165 EVs), the back and forth of any of those three can change that outlook quickly. Obama could lose all three and scrape out 273 electoral votes, but if all three go to McCain, that certainly calls into question the direction the overall momentum is going in to bring about that result. If those three are all going for McCain, for example, are other swings states moving too? And the Electoral College Spectrum gives us a glimpse into the tenuous lead (even though it is 58 EVs) Obama holds at the moment. The Illinois senator has an advantage in all of the states through Nevada, but tightening polls there and in Colorado, New Hampshire and Ohio mean that the job isn't finished -- not that the Obama campaign thought it was. Then again, the perception is that generic Democrat X should/would be well ahead of the generic GOP counterpart and that raises ever so slighty the bar for Obama. The quirk of this iteration of the Spectrum is that it brings the 269-269 tie possibility into focus. 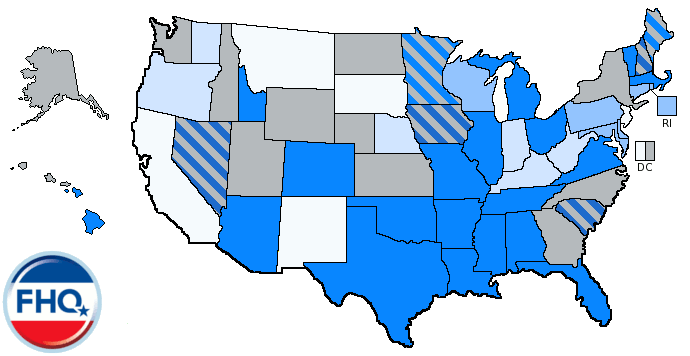 Due to the rank ordering of states, the Victory Line is at a point wedged between Colorado and New Hampshire. Both candidates then, would have to pick up both those states in order to surpass 270 electoral votes. As it stands now, Obama has an edge in all the states to the left of Nevada -- including both Colorado and New Hampshire. That means that McCain would have to pick off not only Nevada and Ohio but Colorado and New Hampshire as well to get to 270. That isn't an insurmountable task, but it is a byproduct of Pennsylvania moving toward Obama. And that causes McCain to have to work in more states, not that the Arizona senator isn't already. That doesn't change the fact that having to go after more states is a more difficult task than getting more total electoral votes in one place like Pennsylvania. There has been some talk out there that Pennsylvania native and currently Delaware senator, Joe Biden, will help Obama lock up Pennsylvania. That may come to pass, but it was probably already good that the Keystone state was heading in the direction of Obama. Finally, while the three close states mentioned above, remain on the Watch List, the list was trimmed by a couple of notable states this time around. Both North Carolina and Florida inched closer to Obama given the new polls while remaining slight leans to McCain. Minnesota also rejoined the list based on the 10 point margin in the latest MPR poll, but just barely. I'll be back later with an update of the pre-convention August polling shifts. In the meantime, get ready for convention season. Did Obama or McCain Win July?